In my last blog, I mentioned that we had been working on a few smaller projects around the house. One of them was a mini-makeover for our basement bathroom. I'm back today with some before and after pictures for you. 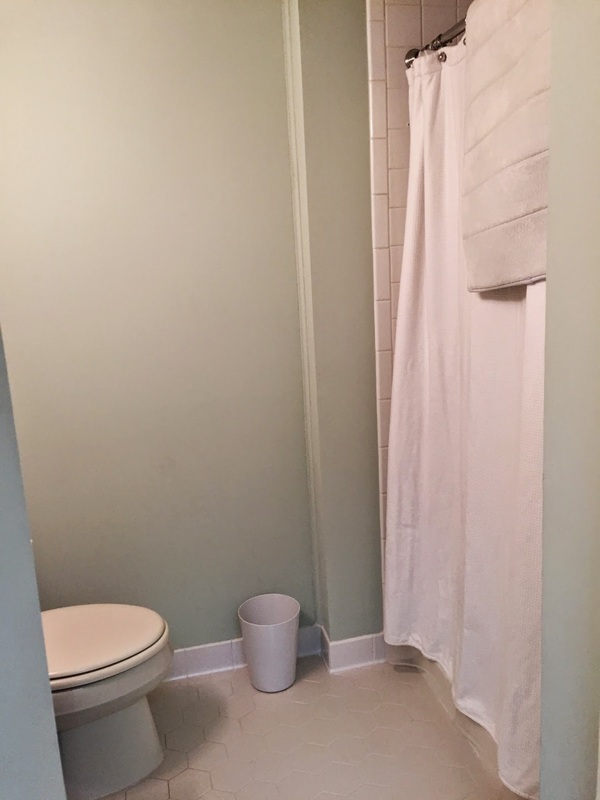 Since this bathroom is down in the back of the basement, it rarely gets used by our family, but it is the main bathroom for any overnight guests because our guest bedroom is also down in the basement. 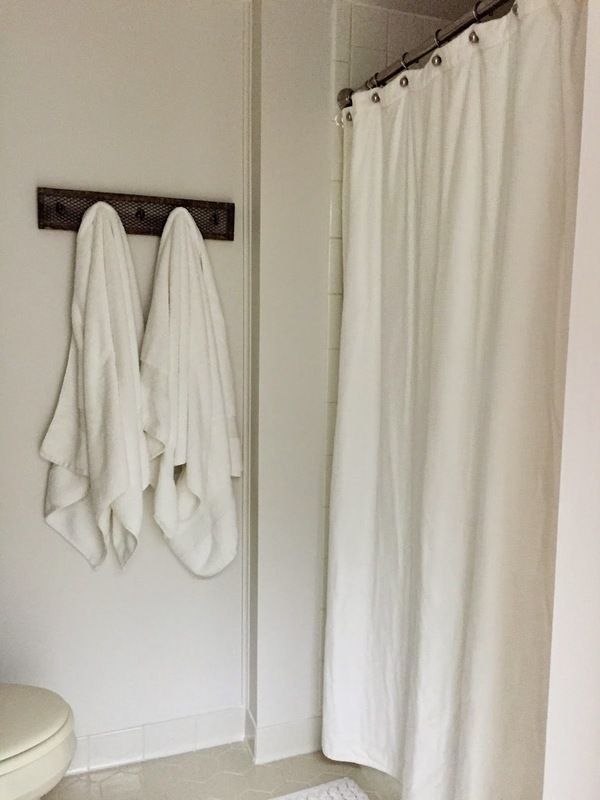 And since it is the guest's bathroom, I wanted it to feel fresh and welcoming for our friends and family when they come to stay with us. I know that bathrooms really can make a difference in how someone feels when they stay in your home. A nice bathroom can make guests feel comfortable and relaxed, whereas I felt that ours was dingy and out-dated. We weren't ready to give it a complete gut job, but I knew it wouldn't take much to give it a fresh, clean look. As you can see, it was basically green and brown and very blah. I knew I wanted to update the mirror. 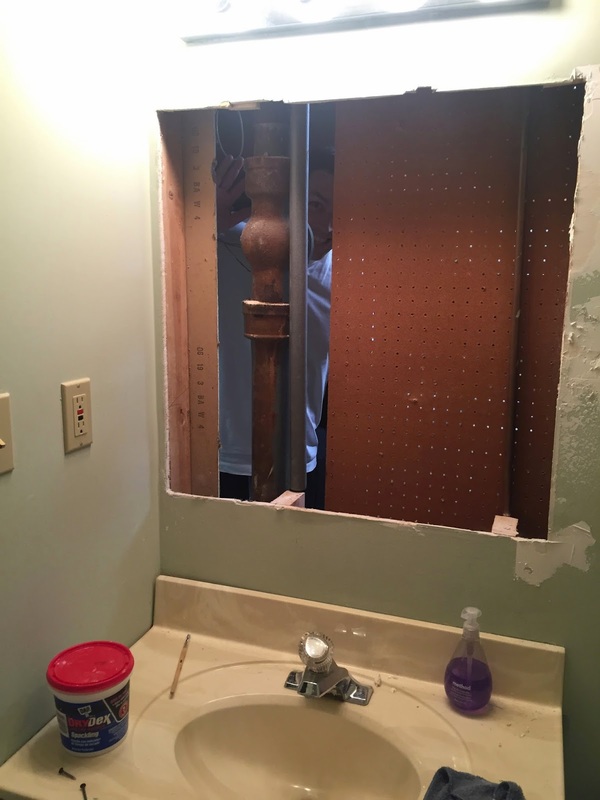 What I didn't realize was that when I took out the mirrored medicine cabinet, we would have a giant hole completely through the entire wall. This meant that Tim had to fix the drywall before I could do much more to the bathroom. Drywall isn't exactly his favorite thing to do, but he's a trooper and got it done for me. Meanwhile, I painted the sink cabinet and shopped for the perfect mirror, towels, and accessories. After Tim finished the drywall, I gave the ceiling and the walls a fresh coat of paint and then he put everything up on the walls. Since I didn't really take any progress pictures, we get to just jump right to the after pictures. 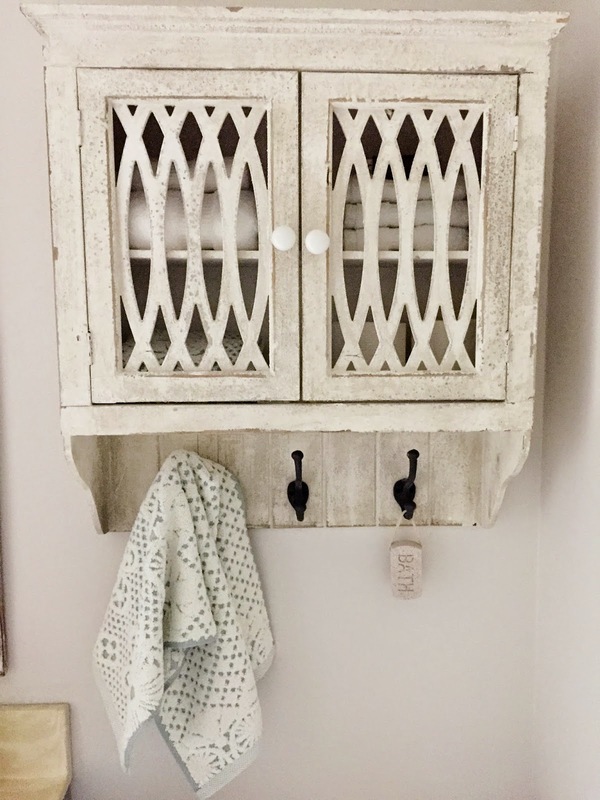 I found this chippy cabinet at HomeGoods one day and it really was the inspiration for the entire bathroom. 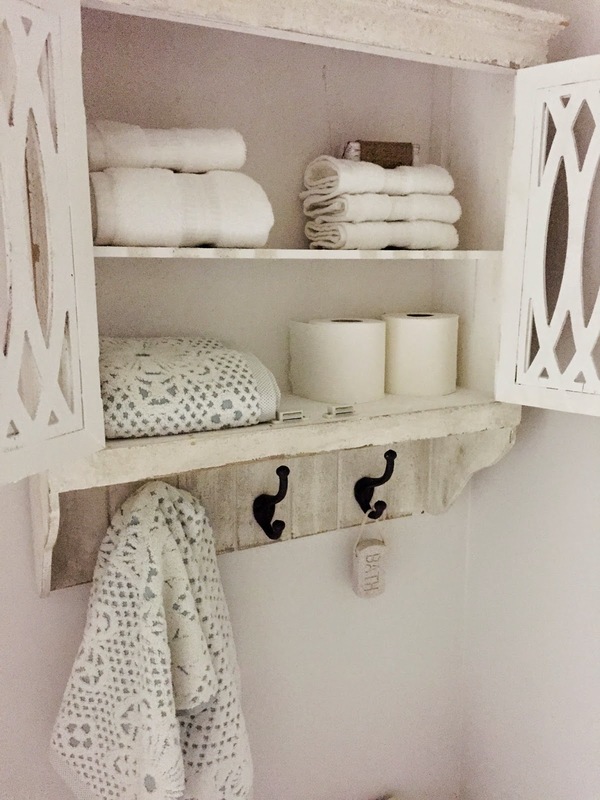 Before I saw this cabinet, I knew I wanted to eventually update the bathroom, but I didn't know what I wanted to do in there. I felt stumped and un-inspired. But this cabinet gave me the perfect starting point. 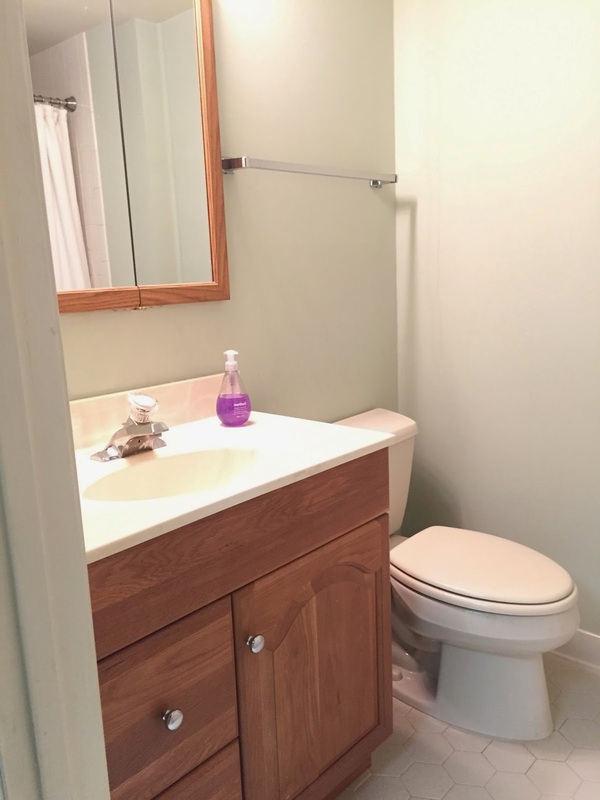 It brings in a lot of fun character and interest, not to mention a little bit of extra storage to this tiny little bathroom. I painted the sink base with Annie Sloan's Duck Egg chalk paint. Chalk paint is so easy because there's no sanding involved. I just wiped the entire cabinet down and then started painting. Afterwards, I sealed it with Annie Sloan wax. I really love how this bathroom turned out. It wasn't a big investment of time or money, but the changes are dramatic. And I hope our guests enjoy their newly updated bathroom. I love it! What a huge difference...it's amazing what a little paint and some fun accessories can do! What a HUGE difference! Well done girl!